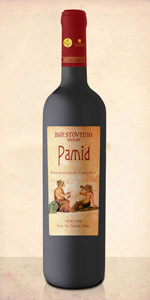 Pamid is a grape variety which is grown in the Bulgarian lands since the time of the Thracians. It has an exceptional freshness and shines with a sparkling light ruby color. It has airy and harmonious body with subtle fruity flavor. It brings to us tastes and emotions from that distant time when the Thracians turned the consumption of wine in culture. It is served slightly chilled at 13-15˚C.